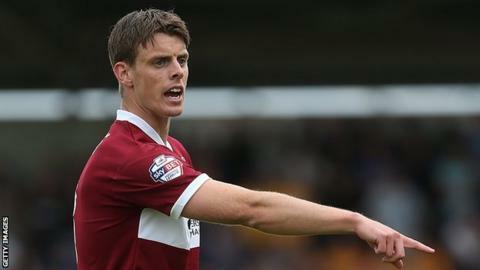 Northampton Town midfielder Ian Morris needs an operation on his knee and will miss the rest of the season. The 27-year-old had been making excellent progress from the dislocated knee he suffered in training in August but he now requires surgery. Manager Chris Wilder told BBC Radio Northampton: "I think we've missed him. He's a versatile player and he was having a decent season. "Last season, he played a big part in us getting the results we needed." The Cobblers, who do not play this weekend after being knocked out of the FA Cup, should have Stewart Murdoch (hamstring) available for their next League Two match against Plymouth on 13 December. Wilder is also expecting to have Ryan Cresswell, Zander Diamond, Lawson D'Ath, Evan Horwood and Lewis Horby available for reserve games before they next play at Sixfields. The competition for places at centre-back is set to be fierce, with six players in the squad capable of playing in that position. "We've got good players at centre-half," said Wilder. "There is a reason why we offered Zander and Ryan three-year deals. We're looking forward to them coming back and it's right that they put loads of pressure on those playing there. "I get a little bit down, and I imagine everyone does, because we expect to do a little bit better than we are doing. "But I think everybody recognises that if you have consistency in selection and you have a good group to pick from, your results are going to get better."